Fresca offers beautifully designed modern bathroom vanities with sinks, mirrors and cabinets to give your home a modern sleek decor and contemporary styling. Whether you prefer the elegance of a traditional bathroom sink cabinet, the convenience of a double sink or the stylish look of a modern vessel sink cabinet, Fresca has what your bath needs. Made of high-quality materials to ensure that they will remain a part of your decor for years to come. Also, make sure to look through Fresca medicine and linen cabinets, faucets, shower panels, toilets and bathroom accessories to find how to complete your bathroom decor. 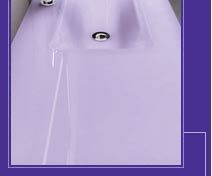 Start shopping for your new bathroom furniture and fixtures today with Fresca.